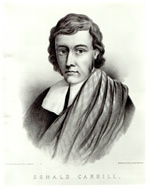 This Cameronian radical had been a fugitive for many years, ever since he darkened a thanksgiving service for King Charles II’s restoration by voicing from the pulpit of his Glasgow parish what many feared in their hearts: that Presbyterians were about to get the rough end of the restoration pineapple. We are not come here to keep this day upon the account for which others keep it. We thought once to have blessed the day wherein the king came home again, but now we think we shall have reason to curse it; and if any of you come here in order to the solemnising of this day, we desire you to remove. That was the end of Cargill’s career as a licensed preacher. His remaining years were illicit services, ducking arrests, and a flight to the Netherlands; he was wounded in service of the Covenanter cause at the 1679 Battle of Bothwell Bridge. now it cannot be called a government, but a lustful rage, exercised with as little right reason, and more cruelty than beasts; and they themselves can no more be called governors, but public grassators, and public judgements, which all ought to set themselves against, as they would do against pestilence, sword and famine raging among them. The grassators finally got him the following year. affectionate, affable, and tender-hearted to all such as he thought had anything of the image of God in them, sober and temperate in his diet, saying commonly, ‘It was well won that was won off the flesh,’ generous, liberal, and most charitable to the poor; a great hater of covetousness, a frequent visitor of the sick; much alone, loving to be retired, but when about his Master’s public work, laying hold of every opportunity to edify; in conversation still dropping what might minister grace to the hearers. His countenance was edifying to beholders; often sighing with deep groans; preaching in season and out of season upon all hazards; ever the same in judgment and practice. From his youth he was much given to the duty of secret prayer for whole nights together wherein it was observed that, both in secret and in families, he always sat straight upon his kneesk with his hands lifted up; and in the posturel as some took notice, he died with the rope about his neck. * The thrust of this militant manifesto is similar to the Sanquhar Declaration issued by Cargill’s ally Richard Cameron, also in 1680.